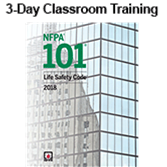 NFPA®'s 2018 Life Safety Code® Essentials Classroom Training helps you apply the 2018 NFPA 101® correctly to protect building occupants. Review concepts and earn your Certificate of Educational Achievement* online! The 2018 Life Safety Code reflects the latest technologies, design approaches, and challenges, and this high-impact seminar provides the tools you need to confidently apply or enforce requirements. Topics span means of egress, determining occupant load and egress capacity, requirements for protection of vertical openings and hazardous areas, high rise buildings, and determining requirements for building services and operating features. A special section covers building rehabilitation. NFPA's training presents a unique opportunity to practice LSC application in a classroom activity based on a realistic scenario. Under the guidance of Code experts, participants will work through a fully developed case study selected to help solidify knowledge. It's excellent training for facility or risk managers, authorities having jurisdiction, safety directors, and anyone responsible for occupant safety and compliance. The 2018 NFPA 101 Classroom Training also offers a Certificate of Educational Achievement* available after the course through an online review and exam. Earn the Certificate to demonstrate proficiency in your understanding of seminar topics. After attending the seminar, review key concepts online and take the online exam at your convenience using the web link provided. You can prepare for the test in your own time frame, using online tools for review. Passing the exam will earn your Certificate of Educational Achievement, confirming your course knowledge. Las Vegas (3/18/19-3/20/19) CLASS IS FULL. Discover how the 2018 NFPA 101 Handbook can help you comply with NFPA 101, Life Safety Code requirements. It includes the full code text along with expert commentary and more than 750 visual references.